So I did a silent stream last night. 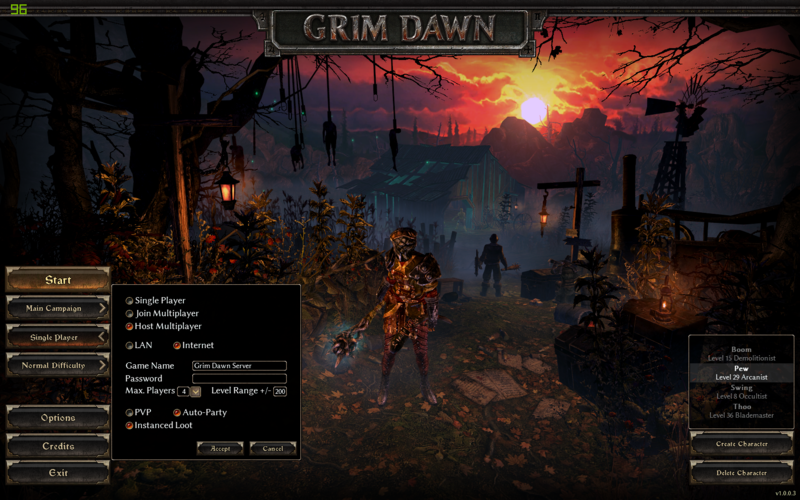 Some questions were raised about multiplayer, so I hopped into some poor soul’s MP game to terrorise him while showing off Grim Dawn’s multiplayer features. Audio gets cut whenever I alt+tab away. Oops. That said, there was some audio issues (no audio) at the start of the stream. 4:13 – Audio gets fixed. Continue smacking stuff. Loot is instanced in multiplayer. That said, all it takes is for one person to trigger the loot to spawn, i.e. popping boss treasure orbs, opening chests, etc. So if you’re the superstitious type, let the RNG blessed do the loot opening. I couldn’t answer this question immediately last night, but there is PVP. A dedicated multiplayer session must be hosted for it. Screenshot attached. You heard that right, this game supports both as an option for hosting multiplayer sessions. Maximum players is still, however 4 per session. There are talks to expanding the number of players per session in future when an arena like map is introduced for PVP, if and when. There is no limit to how far players in a session can wander away from each other. Yes, no limit. There are some measures put in place to prevent your quest from breaking when you join multiplayer games and the host and other players have different quest progression from yours. As always, if you have any further questions, feel free ask me on slack, same username. For reference, this stream was broadcast on a Windows 7 Home Premium, i7-2600k, GTX 670 4GB, 12GB RAM machine using OBS Studio to Youtube Live.